Matthew Apgar - mapgar@shawmedia.com Husmann Elementary School student Asher Johnson uses a straw to make a pingpong ball move during STEM (Science Technology Engineering Mathematics) class on Monday, April 20, 2015 at Husmann Elementary in Crystal Lake. The students were learning about forces needed to push and pull objects. 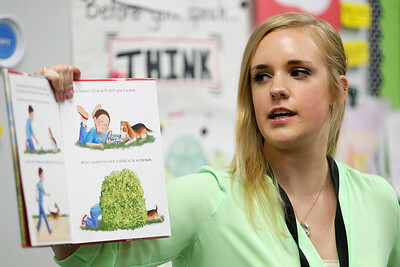 Matthew Apgar - mapgar@shawmedia.com Husmann Elementary School teacher Emily Schaefer reads from the book "Newton And Me" during STEM (Science Technology Engineering Mathematics) class on Monday, April 20, 2015 at Husmann Elementary in Crystal Lake. The students were learning about forces needed to push and pull objects. 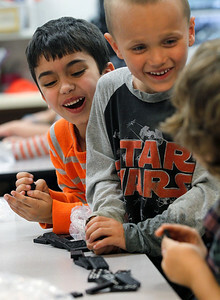 Matthew Apgar - mapgar@shawmedia.com Husmann Elementary School students (from left:) Jack Frailey, Jimmy Czeslawski, and Asher Johnson break out in laughter after a row of dominoes falls they way they planned it to during STEM (Science Technology Engineering Mathematics) class on Monday, April 20, 2015 at Husmann Elementary in Crystal Lake. The students were learning about forces needed to push and pull objects. 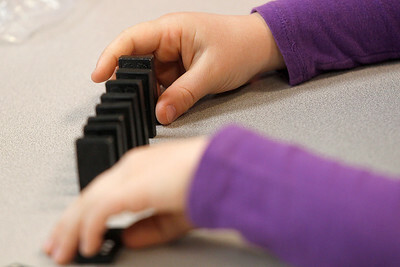 Matthew Apgar - mapgar@shawmedia.com Husmann Elementary School student Lauren Glover carefully lines up dominoes to topple during STEM (Science Technology Engineering Mathematics) class on Monday, April 20, 2015 at Husmann Elementary in Crystal Lake. The students were learning about forces needed to push and pull objects. 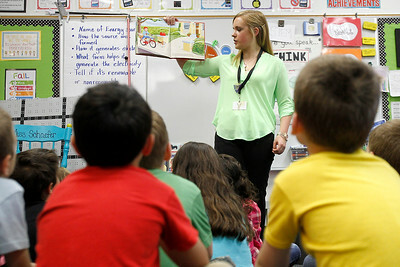 Husmann Elementary School teacher Emily Schaefer reads from the book "Newton And Me" during STEM (Science Technology Engineering Mathematics) class on Monday, April 20, 2015 at Husmann Elementary in Crystal Lake. The students were learning about forces needed to push and pull objects.